There are strong indications that the police have submitted to the National Prosecution Coordination Committee, another report on the investigations into the alleged forgery of the Senate Standing Orders, 2015. SUNDAY PUNCH gathered that in the fresh report, the police indicted the President of the Senate, Dr. Bukola Saraki, and his deputy, Dr. Ike Ekweremadu. It was gathered that the Special Investigation Panel, headed by the retired Assistant Inspector-General of Police, Ali Amodu, explained that a former Clerk to the National Assembly, Salisu Maikasuwa, could not have committed the alleged offence without the connivance of the two principal officers. The SIP was set up by the Inspector-General of Police, Ibrahim Idris, to investigate high-profile cases. The Federal Government had, on October 6, 2016, withdrawn the charges of criminal conspiracy relating to the alleged forgery of the Senate Standing Orders, 2015, filed against the Senate President and his deputy at an Abuja High Court. The government, it was reported, had found out that the investigation was inconclusive and the evidence was not strong enough to sustain a diligent prosecution of the accused persons. Following this discovery, the Ministry of Justice filed an application to amend the charges. In the new charges, only Maikasuwa and a former deputy clerk, Mr. Ben Efeturi, were listed as the accused persons. 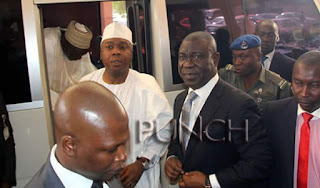 Saraki and Ekweremadu were earlier charged alongside Maikasuwa and Efeturi for allegedly forging the Senate Standing Orders, which were used for the inauguration of the Eight Senate. All of them pleaded not guilty to the charges before Justice Yusuf Halilu and were granted bail on June 10, 2016. Following the amendment of the charges, the Attorney General of the Federation and Minister of Justice, Abubakar Malami (SAN), directed the police to conduct fresh investigations into the case. Saraki, Ekweremadu may face conspiracy charge again. A top police operative, who confided in SUNDAY PUNCH on Saturday, said the SIP had addressed the loopholes the AGF identified in the former report. Giving an insight into the report, a top source at the Force Headquarters said, “Conspiracy is a very wide offence and Maikasuwa couldn’t have done what he did without the connivance of Saraki and Ekweremadu. He added that the evidence and corrections made on the report had been sent to the AGF by the police. He stated, “There were certain documents and evidence they asked us to fine-tune, which we did. We got all the necessary documents, including the Hansard, where publications were made and notices were given. We looked at the Hansard. Was there any amendment during the 7th Senate? There were no amendments; nothing was adopted during the 7th Senate. We got the papers and there was nothing like that. Another highly-placed source, who was familiar with the police probe, informed one of our correspondents on Saturday that the SIP was able to gather the necessary evidence about how the alleged forgery at the Senate was carried out. The source said it was now up to the AGF and the NPCC to decide whether to re-arraign Saraki, Ekweremadu and others or not. It was gathered that the detectives were able to verify the extent of amendment to the Senate Standing Orders 2011, the individuals who authorised it, and the official who ordered the printing of the Senate Standing Orders, 2015. The source added, “The SIP, through painstaking efforts, was able to identify who distributed the printed copies of the Senate Standing Orders, 2015, to senators-elect and it also obtained the complete Hansard of June 9 and 24, 2015, which indicated what transpired on the floor of the Senate as well as other relevant evidence. These were issues the former probe did not resolve. One of our correspondents gathered that the SIP had to bypass the Clerk, National Assembly, Mohammed Sani-Omolori, to get the necessary evidence and documents relating to the case. When contacted on Saturday, the spokesperson for the AGF and the NPCC, Mr. Salisu Isah, said he was not aware of any fresh development in the case. “Just give me some time to find out and revert to you,” he said. Besides the AGF, who is the Chairman of the NPCC, the committee consists of 19 members, including the Solicitor-General/Permanent Secretary, Ministry of Justice, Mr. Taiwo Abidogun and Mr. Dipo Opeseyi. When contacted on Saturday, Saraki decline to comment on the matter, while Ekweremadu said he was not aware of the new development in the forgery case. The Special Adviser to the Senate President on Media and Publicity, Mr. Yusuph Olaniyonu, said, “I have no comment on the matter,” when he was called on the telephone by one of our correspondents. Ekweremadu, who spoke through the Special Adviser to the Deputy President of the Senate on Media, Mr. Uche Anichukwu, said, “We are not aware of that” when he was told that the police had submitted a fresh report to the AGF-led committee. Another aide to Ekweremadu, who spoke on condition of anonymity, wondered why the police would file another report from a fresh investigation when the security agency had sworn to an affidavit that it had concluded its investigations into the case and presented it before a court.